Did anyone else notice their Facebook feed blow up with engagement announcements over the v-day weekend? 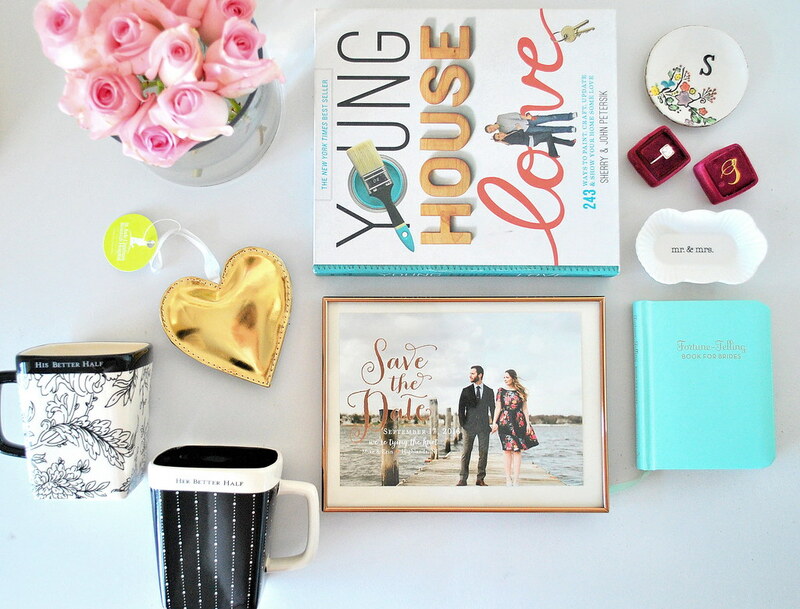 I definitely did, and in the spirit of the month of love I wanted to share some great engagement gift ideas that people were sweet enough to gift me. 1. 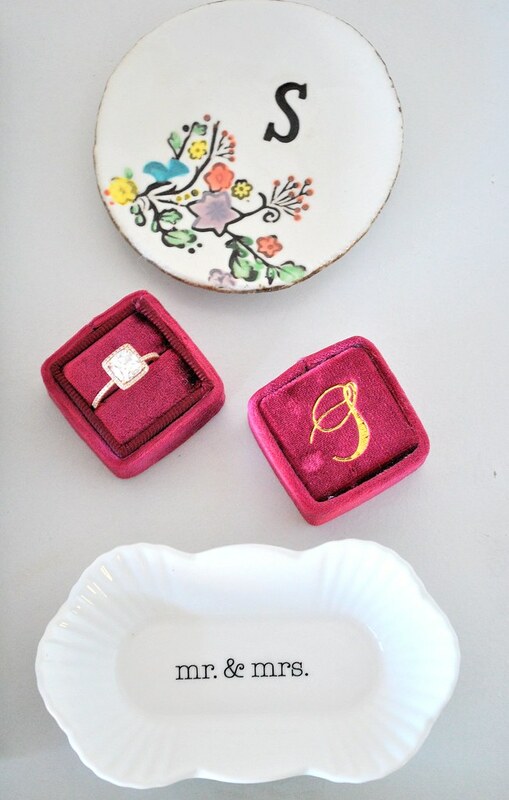 Ring dishes. These are literally where my ring lives when I am home 75% of the time. I just don't like to cook or clean with it on so I love having a designated spot I can place it (I keep one by the kitchen sink and one by my bathroom sink) while I go about my business. You can buy them, find my exact ones here and here or if you are crafty, you can try your hand at making them, DIY here! 2. The Mrs. Box. While I LOVE my new bling I don't necessarily love the leather box it came in all that much. These beautiful heirloom boxes are the most fun upgrade and last a lifetime. The monogramming is optional but gives it an extra special touch. I feel like it's getting your ring the best luxury bedding to sleep in when you have to put it away. 3. Ornaments! No matter what time of year you get engaged, starting from scratch on sentimental or unique ornaments can be a very expensive investment (hello, target box of 20). I so appreciated the flurry of thoughtful cute ornaments I got to put on our otherwise barren first "engaged" tree! One of my favorites we got is here. 4. Young House Love. After I got this book I spend a whole morning perusing it in bed. I had just moved into a new apartment the weekend after we got engaged so it was full of great inspo for my small space and small decorating budget. I can't wait to try out some projects for our terrace when it gets warmer. 5. Cheeky "His & Her Better Half" mugs. Mugs are something that I didn't even put on our registry because I kind of love the mix match pick them up as you go through life vibe that they allow for. I've kept one from every job, our schools, and my fiance has a couple from his childhood sports. I love that we have these (the only two that match in our collection) to remember this time. I couldn't find my exact ones but think these are so cute! This would also make a pretty simple DIY gift. 6. Picture frames. Lots, and I mean LOTS of happy photo worthy moments on the horizon, yet I don't really have too many frames to display them in. I love this pretty rose gold one my future mother in law got me to match my ring! I put our save the date in it as a memento. 7. Fortune Telling Book for Brides. Just for fun! I like to pop in there every time I make a decision about something and see what the little book says it "means." They have something for everything in there (month, flower, weather) it's nice to be silly during the sometimes too serious process. 8. Not pictured: My planners! I literally live and die by them so much that I didn't have them to photograph because I keep them in my office at work to stay on top of everything. So many meetings, reminders, and coordination goes into throwing the biggest party of your life so planners are everything. I was lucky enough to get this one and this one.